It’s that time of year again. And by that, I don’t mean the holiday season or the kick-off of awards season, I mean it’s time for our second MCU movie of the year. This slot has become one that introduces a brand new character into the MCU with the first one being one with the established characters. Previously, we’ve been introduced to Guardians of the Galaxy and Ant-Man in this spot and now we have Doctor Strange. Since the focus of the MCU has largely been the Infinity Stones/Gems (the origins of which are explained in Guardians of the Galaxy), it was logical to include Doctor Strange in the MCU because he factored very heavily in the ‘Infinity Wars’ comics mini-series in the early ‘90s. So who is Doctor Strange? 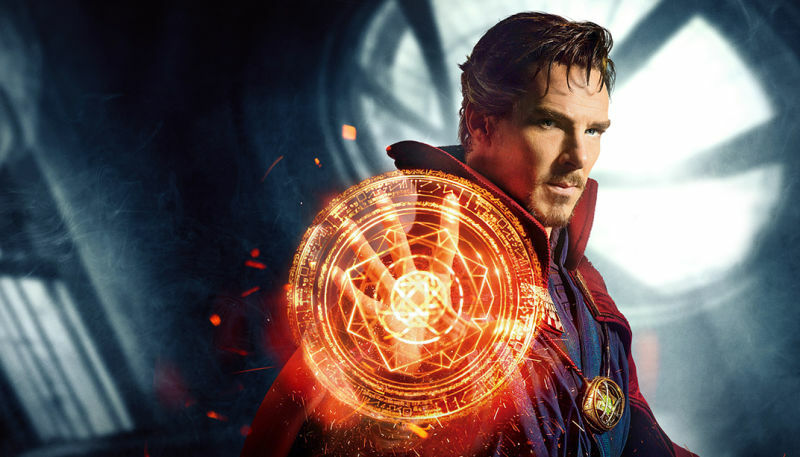 Well, Doctor Steven Strange (Benedict Cumberbatch) is a world-famous neurosurgeon who suffers extensive nerve damage to his hands after a near-fatal car crash. No longer able to practice medicine because of the loss of the dexterity in his hands, he seeks to find medical cures so he can resume his career. Every doctor in the world tells him the damage is too severe and even after expensive experimental procedures, his hands are still not much better. Penniless and unable to do the work he was trained to do, he sets off to Nepal for a cure he was tipped off to by Jonathan Pangborn (Benjamin Bratt), a man who had been so crippled by an accident that Strange refused to treat him, stating his case was hopeless. Nevertheless, he is now fully mobile, walking and playing basketball with ease. While in Katmandu, Nepal, he is approached by Mordo (Chiwetel Ejiofor), who invites Strange to the Kamar-Taj where he will find his cure. Strange meets The Ancient One (Tilda Swinton), who shows him the mystical and magical world that is all around us but only a select few can see and manipulate. Strange thinks he’s getting a cure for his hands, when he’s really being drafted into an invisible war of sorcerers against Dormammu, an ancient creature who consumes souls to survive, and his lackeys led by former Kamar-Taj student Kaecilius (Mads Mikkelsen). The script, first penned by Prometheus scribe Jon Spaihts then rewritten by director Scott Derrickson and C. Robert Cargill, opens up the MCU in a new way like Guardians of the Galaxy did but in a different direction. Where Guardians introduced us to the galaxy and universe at large and how it plays into the MCU, Doctor Strange delves into the mystical and the magical, further playing on the idea of realms and alternate dimensions first introduced in Thor. They also weave in the Infinity Stones by making Strange’s amulet, The Eye of Agamotto, the Time Stone. The world they create for the film is astounding, where people can conjure weapons out of thin air and travel great distances in seconds. This world-building is lain overtop a reasonably standard origin story about tragedy and redemption for the hero but it also serves as an origin for a man who becomes Strange’s most bitter adversary, Mordo (stay tuned all the way through the credits for this one, there is a post-credits stinger that sets up Doctor Strange 2, which I think should be called Doctor Strange: Sorcerer Supreme). It’s an interesting way to formulate a screenplay and they do well with it, creating some genuine characters along the way (but there are more characters who are just kind of there as types). The world-building continues through Derrickson’s direction. His visual sense and scope is impressive, though many will credit some of his concepts to Christopher Nolan and his 2010 film Inception and that comparison is justified. He not only manages to make this world of magic eye-poppingly inventive, he also gets the loosest performance of Cumberbatch’s career (he even smiles and tells jokes!). 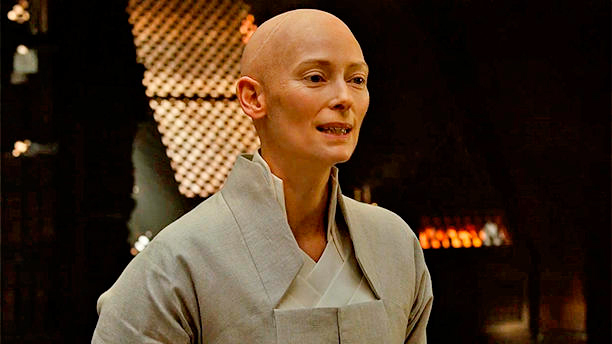 One major complaint I have about Derrickson is his choice to cast Tilda Swinton in the role of the Ancient One. He took a character that, in the books is an old East Asian man (presumably Nepalese or Tibetan) and turns him into a middle-aged white British woman. If they’d worked in somehow that she can change her appearance to make some people feel more comfortable or an East Asian woman, that would be fine, but instead, Mordo says they know little about her except that she is centuries old and Celtic (though her accent would not lead you in that direction at all). So they’ve completely removed the East Asian aspect to the character, whitewashing it entirely. Many may not find fault in this since Hollywood has been doing this kind of thing for over 100 years, but the MCU had seemed to be striving to be more ethnically diverse (producer Kevin Feige has said as much about next year’s Spiderman: Homecoming, wanting to make the high school look more real and diverse) but here it removes an opportunity for diversity. On top of that, the MCU seems to have difficulty representing Asian characters on screen. The only two Asians I can think of are both on ABC’s Marvel’s Agents of S.H.I.E.L.D. (Daisy, played by Chloe Bennett and May played by Ming-Na Wen). Even one of the most important villains to Iron Man, The Mandarin, was whitewashed by making him Ben Kingsley (who is half Indian, and therefore technically Asian, but he’s not Chinese as The Mandarin is and is also British). The plot twist was funny, and it may have been done so a Chinese man wasn’t depicted as a terrorist (they need that China money, after all), but in Doctor Strange it just makes no sense at all. A frequent collaborator of Derrickson’s (I can’t remember his name) suggested it was done to be gender inclusive and also to avoid casting an Asian of the wrong country (like the negative press Rob Marshall got when he cast Chinese actresses as Japanese in Memoirs of a Geisha) but that suggests a lack of trying very hard. Swinton is a world-class actress and is very good in the role, but it should never have been offered to her in the first place. Derrickson even though about casting someone non-Asian as Wong because he didn’t want the only Asian person in the movie to be seen as a servant. True, Wong (played by Benedict Wong) becomes the librarian, but he is also integral in the battle against Kaecilius and is quite a formidable sorcerer and warrior. And an easier way around that would have been to cast an Asian in the role of The Sorcerer Supreme (The Ancient One’s title) in the first place. Despite that major problem, Doctor Strange still entertains thoroughly and sets up the MCU for even bigger things to come. Doctor Strange is scheduled to be in Avengers: Infinity War and will also be seen in Thor: Ragnarok in 2017 (the mid-credit scene was taken from that upcoming film). Cumberbatch does a great job with this little-known (outside of die-hard fans) character and makes the film fun and engaging, situating the film in the solid middle of the MCU.